Our Courtyard garage doors are designed to simulate the elegant wood designs of traditional carriage house doors, but these are constructed with insulated steel. You get the allure of wood with the durability of steel and these classic designs will enhance your home’s architectural appeal. You can further personalize the look of your door by selecting from a wide range of window and hardware options. Each garage door in the Courtyard Collection® offers numerous design options to give any home the beauty of a wood door with the durability of a steel one. These steel doors provide excellent function, as each door comes with superior insulation (R-values up to 12.76) and the wood grain textured trim boards are resistant to both dents and the elements. They also provide exceptional style, as each door comes in a variety of colors, windows and decorative hardware options and is fashioned to emulate the beautiful traditional wood designs of carriage house doors. There are nine standard colors for The Courtyard Collection® garage doors, or they can be painted to coordinate with the current colors of your home. Color selections may not be available for some models. Door overlays and window trim are available in the colors shown (additional charges may apply). 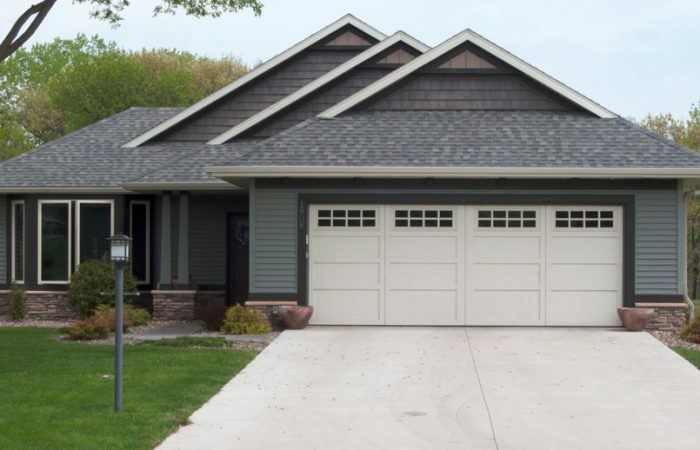 The 160 series garage doors can be painted solid or two-tone. The 370 series is only available with trim that is the same color as the door. Gray and Black are available on 160 series only. Actual door color may vary slightly from the digital representation above. Color samples are available by request through your local Overhead Door Distributor. You can additionally personalize your garage door by selecting from a variety of decorative handles and hinges. Contact your Overhead Door Distributor for additional decorative hardware options.